"You are going to bleed and be tortured," the caller said, according to police. 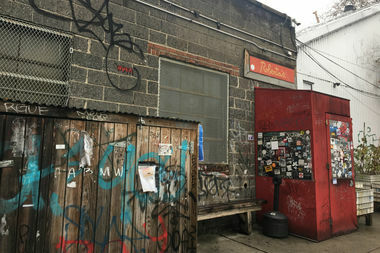 EAST WILLIAMSBURG — A worker at the popular pizza joint Roberta's received death threats after rumors spread on YouTube and Twitter that it was connected to Pizzagate — the fake-news conspiracy theory claiming Hillary Clinton was running a child abuse ring out of a Washington, D.C., pizzeria. A 24-year-old worker who answered the phone at Roberta's Moore Street restaurant on Dec. 1 at 11:15 a.m. was told, "You are going to bleed and be tortured," according to police. The next day, workers reported a similar call at 5 p.m. in which somebody asked if Roberta's had any connection to a website that had published the fake news about Pizzagate — a conspiracy that spread online and inspired a gunman to open fire inside the D.C. eatery while investigating its claims. The phone calls came after social media users started to tweet fake news that Roberta's was tied to the conspiracy theory. YouTube user drumstick74 published an eerie video about Roberta's on Thursday that compiled a series of screengrabs from the restaurant's Twitter and Instagram accounts, claiming the East Williamsburg haunt had connections to the fake scandal. The video quickly began to circulate on social media. Drumstick74 had previously made a similar video about Besta Pizza in Amherst, NY, according to his YouTube account. Other conspiracy theorists retweeted images from Roberta's accounts saying the restaurant was a favorite spot of the Clinton family, while a Reddit user cited a 2012 instance when Bill and Hillary Clinton went to dine at Roberta's. The fake stories alarmed officials in the wake of harassment and death threats received by workers at Washington D.C. pizzeria Comet Ping Pong, which was at the center of the initial story of Clinton's involvement with a child abuse ring. They culminated on Sunday when a North Carolina man armed with an assault rifle reportedly entered the pizzeria in a bid to investigate the claims and opened fire. The Pizzagate conspiracy has been thoroughly refuted, even by President-elect Donald Trump. But it has been perpetuated by those close to the president-elect, including Michael G. Flynn, the son of Trump's pick for national security adviser and a member of his transition team. He insisted on Twitter that he would believe "Pizzagate" until it was proven otherwise. Trump has since fired Flynn from his transition team because he used Twitter to spread the conspiracy theory, according to reports. Workers at Roberta's couldn't immediately be reached for comment. No one had been arrested for the threatening phone calls as of Wednesday, police said.